MELVILLE, N.Y., January 6, 2014 – Canon U.S.A., Inc., a leader in digital imaging solutions, has announced the latest offerings in its lineup of PIXMA printers – the Canon PIXMA MX532 Wireless1 Office All-In-One, PIXMA MX472 Wireless Office All-In-One, PIXMA iX6820 Wireless Inkjet Business and PIXMA iP8720 Wireless Inkjet Photo models – to address the varying needs and budgets of personal and home office users. Ideal for business professionals who work from home, the new office printers offer multiple solutions to help make business processes run as smooth as possible when outside a corporate setting. For crafting and creative project enthusiasts, the new photo model delivers high-quality imaging output as well as a variety of creative tools. With the introduction of these devices, Canon looks to provide a wide-range of end-user benefits and premium applications to multiple consumer markets. With cloud-based PIXMA Printing Solutions2 (PPS) application capabilities, the Canon PIXMA MX532 Wireless Office All-In-One Printer can easily access important images and documents for printing that otherwise may have been trapped on mobile devices and popular online services like Facebook®, Twitter®, Flickr®, DropboxTM, Picasa Web AlbumsTM, Evernote®, Photobucket® and Canon iMAGE GATEWAY3. The PPS app allows users to wirelessly print multiple document formats including Word, Excel, jpeg and pdf from a compatible wireless-capable mobile device or tablet from almost anywhere. The mobile app also provides convenient access to the printer’s user interface to check ink model number information, online printer user manuals, and other important printer information. Making the printing process even easier, the printer features both auto-duplex printing and FastFront loading functionality so users can experience quick and easy paper and ink cartridge loading without having to stand the printer lid upright. Other notable features include Quiet Mode, and a front paper tray that conveniently holds up to 100 sheets for large-volume jobs. The PIXMA MX532 printer will have an estimated retail price of $149.99. 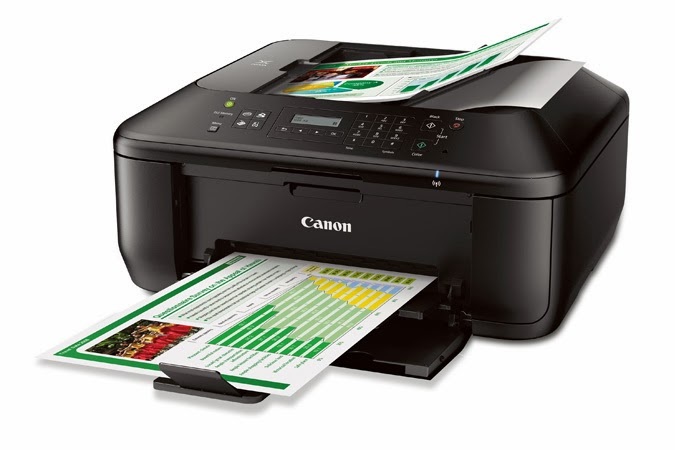 The Canon PIXMA iX6820 Wireless Inkjet Business Printer is an excellent office solution for users looking to print and produce materials that are a combination of text and graphics. With five individual ink tanks, the PIXMA iX6820 printer is great for business projects requiring graphic detail in color and black-and-white. To further improve upon its black text printing capabilities, the iX6820 utilizes optional high-yield black cartridges for larger print jobs. The printer also offers a Solution Template to help ensure endless creative possibilities when creating new projects such as posters, fliers, menus and more for clients or other business ventures. The printer’s Quiet Mode helps ensure the device fits in seamlessly with any business location. The PIXMA iX6820 printer will have an estimated retail price of $199.99. Canon PIXMA Inkjet Photo printers are designed to bring the true beauty and emotion of a photograph to life. Crafting and do-it-yourself (DIY) enthusiasts will appreciate the new Canon PIXMA iP8720 Wireless Inkjet Photo Printer which features six individual ink tanks for vivid color and rich color gradient and can produce images up to 13-by-19-inches – allowing for greater artistic expression when displaying images and crafting photo projects. With an impressive 9600 x 2400 maximum dpi4, images are sharp, crisp and ready to become artwork. Combined with Canon’s Creative Park Premium and genuine Canon software, this printer offers endless creative opportunities to let inspiration flow. The PIXMA iP8720 printer will have an estimated retail price of $299.99.